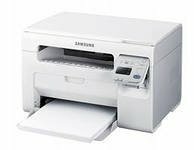 Samsung SCX-3405 is a modern black and white laser MFPs, which combine in themselves printer, scanner and copier. Has a stylish look and a good technical characteristics. Thanks to its small and compact design, the Samsung SCX-3405 not take up much space on the table, after all its dimensions are only 389x274x249 mm, weight 6.7 kilograms. Print quality is too high and is 1200x1200 dpi when printing speed up to 20 pages per minute. Also, the Samsung SCX-3405 supports such formats print A4, A5 and B5.